These simple cinnamon sugar tortilla chips are a perfect afternoon snack to make with the kids My children love "tortilla toast chips" as we call them. 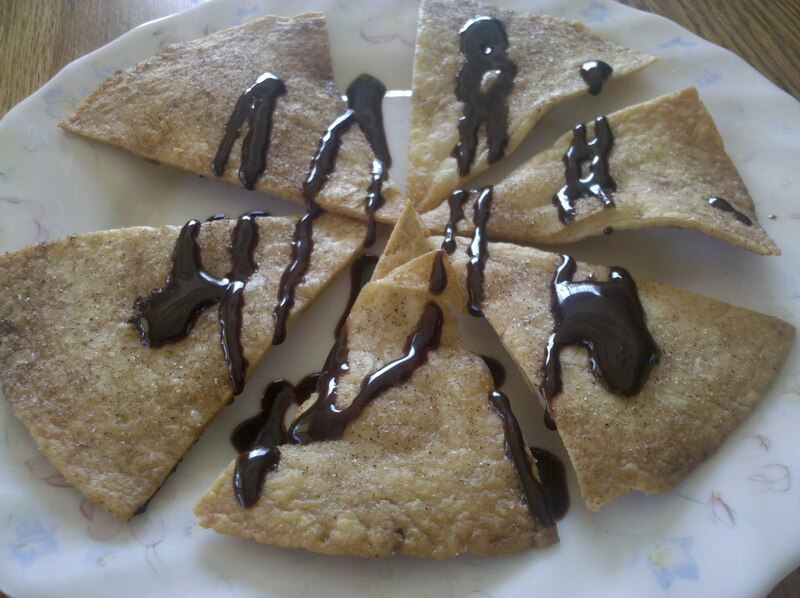 You can even drizzle them with chocolate sauce for a not-too-heavy after dinner treat. Prep your work area: Preheat the oven to 350 degrees.Line the cookie sheet with parchment paper. Mix cinnamon and sugar together to form a mixture. Set aside. Stack tortillas together. Using the rotary pizza cutter, slice them like you would a pizza or a piece of pie. Lay them out alternately on the cookie sheet. Melt half a stick of butter in the microwave, stir. 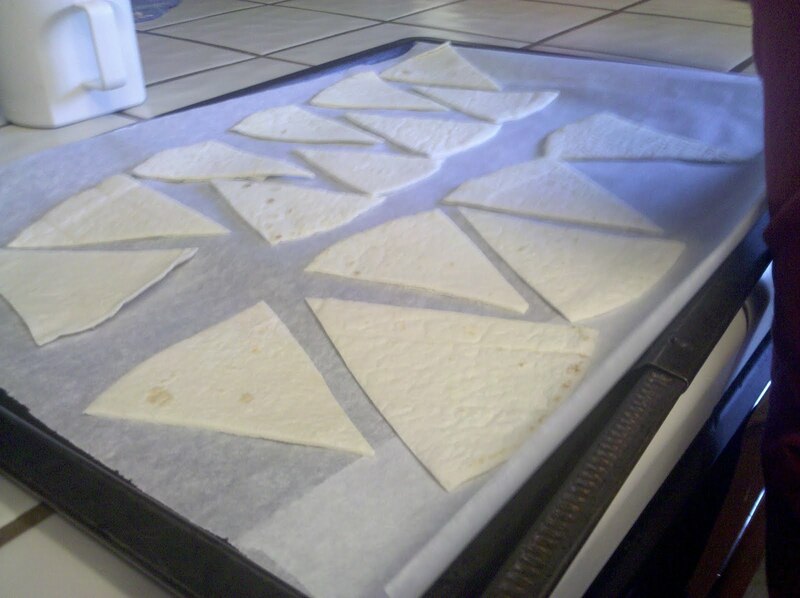 Using the basting brush, brush each tortilla triangle with butter on one side. Sprinkle with cinnamon sugar mixture. 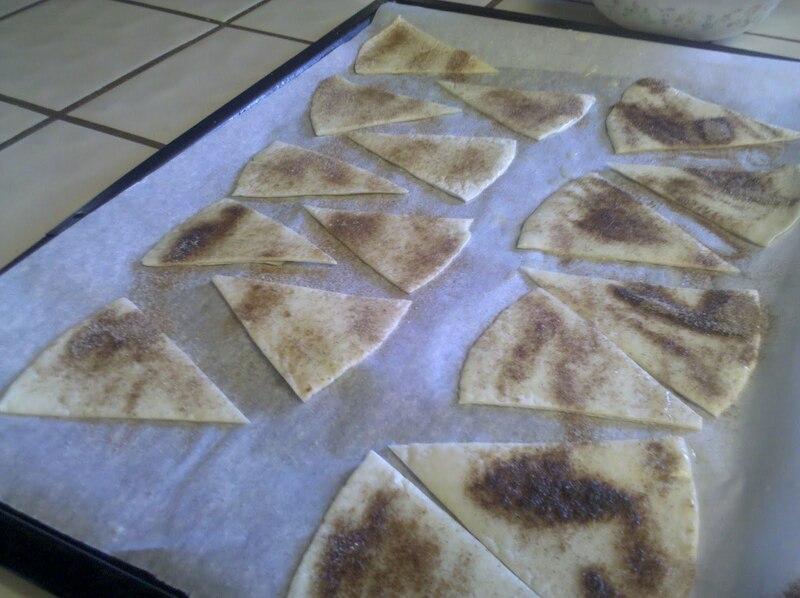 Remove from oven, flip the chips over, baste again with butter and sprinkle with cinnamon sugar. Put them back in the oven for 5-7 minutes. The kids helped with the basting and the sprinkling of the sugar. Can you guess which side they did? They became a little impatient with the basting, so I finished up the top of the tray. Word to the wise, light coats of butter and cinnamon sugar work the best. Less is more. *This recipe comes courtesy of my good friend Alicia. She owns a cupcake business in Orange County, CA and I am proud to call her my friend. You can also just spray cooking spray on them and skip the basting to make it quicker. Though I'm sure the butter makes it extra tasty. SO YUM! I'm posting a small post of links today and including this. Delish! I havent had these since I was a kid! I have to make them for my boys! Win a $25 Target GC! Those look good. My mom made something similar for us when we were young, and I forgot about it.